Should I Be Worried About Mildew on My Roof? When you think of mildew, you probably think of waiting too long to clean the bathroom or what happens when the basement floods. You may not have considered that mildew can wreak havoc on your roof. If you’ve noticed black streaks on your roof, you’ve probably thought nothing of them. They happen on all houses in warm, wet climates, right? Well, those black streaks are actually black moss, and while the moss itself is unsightly but harmless, some of the things that come with it are actually quite harmful to your home and your health, namely mold and mildew. If you’re wondering if you should worry about the mildew on your roof, the answer is yes. Moss, algae, mold, and mildew are all signs of moisture buildup on the roof. Not only are mold and mildew bad news to inhale, but they are also signs that your roof could be in trouble structurally. Read on to find out what could go wrong and how to deal with a rooftop mildew problem. First of all, let’s talk about the health hazards associated with roof mildew. If you have recognizable mold, mildew, moss, or algae on your roof’s exterior, there’s a good chances you may have it on the interior, as well. If your attic is very humid and isn’t well ventilated, mold and mildew can build up in there. That means, if you go into the attic to get things out of storage, you’ll be carrying mold and mildew down into the house with you. That, in turn, means that you’ll be breathing in mold and mildew spores, which promote sinus infections. You don’t want to expose yourself and your family to poor breathing conditions, so make sure that you take care of your roof mildew problem before it becomes a hazard to your health. As we mentioned earlier, the evidence of mildew and other growths on your roof is also evidence of excess moisture. That moisture, sitting on your roof, collecting in mildew and moss, will eventually weaken your roof. Once it’s weak enough, it will fail, and you’ll have a leak on your hands. We don’t have to tell you that a leaking roof is not good news for your belongings or your health. As moisture leaks in, it creates a breeding ground for more mildew and mold, which will, again, create bad air quality and health problems. At the same time, you’ll have to deal with moisture damage to your insulation, your ceilings, and your possessions. Worse yet, if you didn’t take the proper precautions against mold, mildew, and moisture damage to your roof, none of the repairs will be covered by your warranty. Your homeowner’s insurance may cover it, but why deal with this incredible hassle in the first place? Fortunately, getting rid of growths on your roof, like mold, mildew, and moss, is actually quite easy. It just involves two quick errands, a little bit of mixing, and some spraying. Pick up some trisodium phosphate at just about any home improvement store you like, and then go to the grocery store for some chlorine bleach. Mix one cup of trisodium phosphate, ¾-quart of bleach, and three quarts of water. Using a garden sprayer, spray this mixture over the entirety of your roof. You may want to wear a dust mask while you do this to avoid breathing in fumes from the bleach. Wait five minutes after you spray the roof down so that the mixture can soak in. Then take your garden hose and rinse your roof off with water. 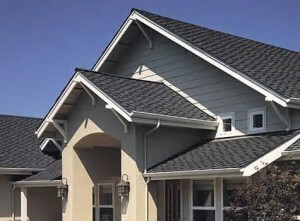 This should take care of your mildew problem and keep your roof in good condition. During the spring and summer, when the weather is warm and humid, you may need to do this once a month or bi-weekly to be sure that your roof stays clean and strong.